• The new 840 EVO mSATA (mini-Serial ATA) Solid State Drive (SSD) line-up includes the industry’s first 1 terabyte (TB) mSATA SSD. • The 1TB mSATA SSD’s thickness and weight are approximately 40 percent and a twelfth of a typical hard disk drive (HDD) respectively. • The 1TB version offers 98,000 random read and 90,000 random write IOPS (Input Output Operations Per Second) , as well as sequential read and write speed of 540 megabytes per second (MB/s) and 520 MB/s. • The 840 EVO mSATA SSD line-up will be available this month globally, and exact launching date can vary depending on the region. 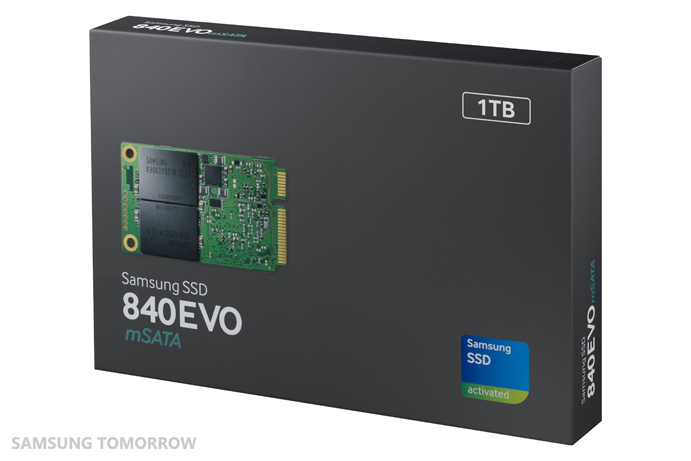 Samsung Electronics announced that it launches 840 EVO mSATA (mini-Serial ATA) Solid State Drive (SSD) line-up, including the industry’s first 1 terabyte (TB) mSATA SSD this month. 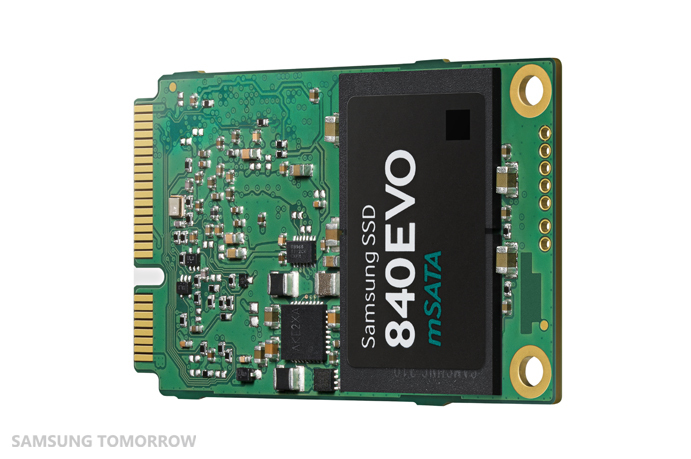 The new 840 EVO mSATA SSD utilizes Samsung’s advanced 128 gigabit (Gb) NAND flash memory based on 10 nanometer class* process technology. To form a 1TB version SSD, a total of four flash memory packages are used, each package having 16 layers of 128Gb chips. Based on the advanced memory technology, the 1TB mSATA SSD comes in a thickness of 3.85 millimeters and a weight of 8.5 grams, which are approximately 40 percent and a twelfth of a typical hard disk drive (HDD) respectively. The 840 EVO mSATA SSD line-up is available in 120 gigabyte (GB), 250GB, 500GB and 1TB, and achieves the highest level of performance based on Samsung’s proprietary controller and TurboWrite technology. The 1TB version offers 98,000 random read and 90,000 random write IOPS (Input Output Operations Per Second), as well as sequential read and write speed of 540 megabytes per second (MB/s) and 520 MB/s, enabling complex multi-tasking for advanced users. The 840 EVO mSATA SSD line-up will be available this month globally, and exact launching date can vary depending on the region. 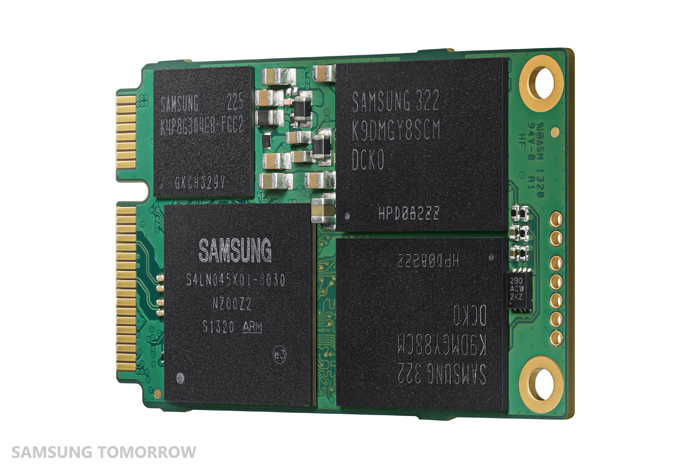 Samsung will continue to introduce leading-edge SSDs with higher performance and security level, and maintain its leading position in the global SSD market.